Six Subject Groups are offered at two levels of achievement. Each diploma candidate must pass IB examinations in all six subjects. Half of the courses are taken at Higher Level (HL) and half at Standard Level (SL). The Extended Essay (EE) is a supervised 4,000-word academic research paper on a specialized subject. Students develop advanced skills in independent research and writing. Theory of Knowledge (TOK) is a course that emphasizes critical thinking skills. TOK encourages students to be aware of subjective biases, to analyze evidence, and to appreciate other cultural perspectives. 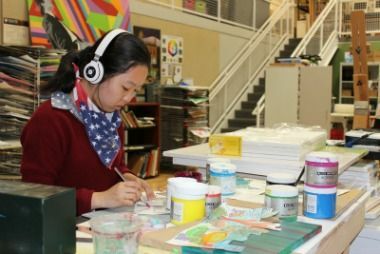 Creativity, Activity and Service (CAS) is a fundamental part of the Diploma Program that provides a balance to academic studies. The CAS requirement encourages personal growth and development and the acceptance of new challenges. Courses go beyond the rigor of traditional college preparatory courses and represent 150 teaching hours. Courses encompass material requiring 240 teaching hours and two years of extensive study. IB Diploma Candidate: A student pursuing the IB Diploma, taking at least 6 IB courses (one from each subject group) and distinctive features. IB Course Candidate: A student taking any IB course or completing a distinctive feature, whether it is one or more.